Abundant sunshine. High 78F. 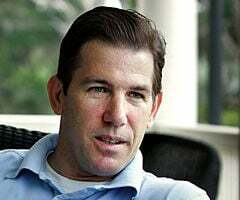 Winds W at 5 to 10 mph..
Thomas Ravenel said he feels horrible for what he called a "freak accident" Sunday when his all-terrain vehicle rolled over, severely injuring a friend riding with him. The accident occurred on Ravenel's Brookland Plantation property on Edisto Island. The two men were riding in a four-wheeled Kawasaki Mule and heading across a grass field when the vehicle flipped, pinning the man's right leg underneath. Ravenel said he was turning to the left when the ATV rolled to the right. The wreck crushed the right leg of passenger Kenneth M. "Marty" Boissoneault, 51. Boissoneault has a large body frame and was dangling his leg over the side at the time of the accident, said Ravenel, who fell on top of Boissoneault and wasn't hurt. Neither man was wearing a seat belt. The injury was so severe that Boissoneault had to be airlifted to the Medical University Hospital. Ravenel said it was fortunate that he had several guests at the plantation that afternoon who helped in righting the ATV, freeing the injured man. Boissoneault is a salesman for Carolina Chain & Cable Co. Inc., in Charleston. He is listed in serious condition at MUSC's intensive care unit. Ravenel said it appeared the vehicle's tires got snared in the grass. He estimated the ATV was traveling about 10 to 15 mph at the time. "I've made turns a lot sharper than that," he said, adding that he has owned the ATV for about a month. "The tires just caught the ground wrong." Drugs or alcohol were not involved in the incident and Ravenel won't be charged, said Maj. John Clark, public information officer for the Charleston County Sheriff's Office. Brookland Plantation is listed on the National Register of Historic Places. The 3,440-square-foot house was built in 1803 and served as an orphanage in the 1960s. Ravenel said he bought it in 2006 because he heard there was an effort to subdivide the 60-acre Laurel Hill Road property, and he wanted to save it. Ravenel, a Republican, was elected treasurer of South Carolina in 2006. But he resigned his post in July 2007 and eventually served 10 months in federal custody after pleading guilty to conspiracy with intent to distribute cocaine. Reach Schuyler Kropf at 937-5551 or skropf@postandcourier.com.